Marvel Strike Force, the mobile character-collection title from FoxNext, is coming up on its one-year anniversary. While the community has criticized various aspects of the game’s live-service approach, such as the implementation of the random nature of its supercharging Red Stars system, reception has been overall positive on the experience and the player base has spent more than $150 million on the game in its first 12 months. 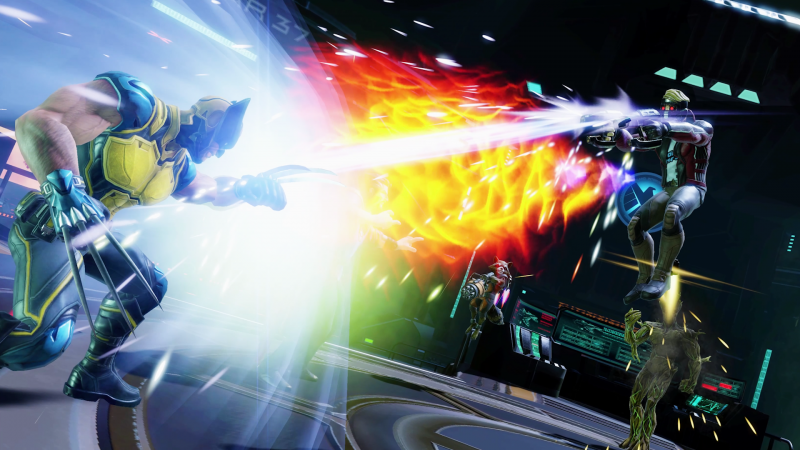 I sat down with FoxNext vice president and general manager Amir Rahimi to talk about the first year of Marvel Strike Force, what the Disney acquisition means for the game, and what players can expect in Year Two and beyond. To learn more about the massive Alliance War update coming near the game’s first anniversary, head here. 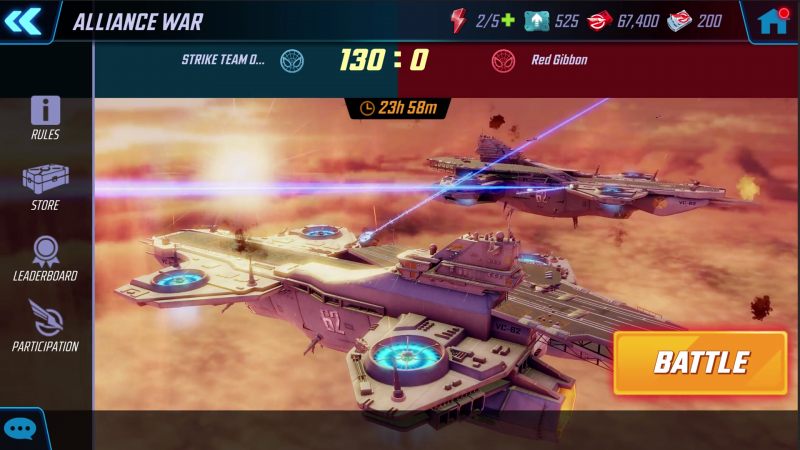 GI: You’re celebrating a year of Marvel Strike Force with the new Alliance War mode. This has been in the menu as a placeholder since launch last year. Rahimi: This is a feature that we actually came up with at the same time that we concepted the entire game. For games that are live services, you need them to evolve and grow, and you need an almost endless supply of cool, new features to entertain your fan base with. The first generation of games-as-service, you’d launch a game, see how it did, and then you would just start adding stuff. Often times, a lot of big systems you’d see added onto games would feel bolted on and not quite natural. As live-service games mature – and certainly this is what we’re trying to do in this case – you kind of think about it the way you might concept a pilot for a TV show; you don’t just think about what will happen in the pilot, you think about what will happen over the entire course of the show, hopefully running many, many seasons. That was the approach here. We wanted to not launch with Alliance War because the game was going to be a big enough challenge to get out there, but really design the game for Alliance War and design them hand-in-hand. We started working on this feature literally the day we started working on the project, and we’ve, kind of in the background, been slowly working with it and noodling with it and thinking about it this entire time. What took so long to implement Alliance War? By the time we launched the game, the foundation for the feature had already been implemented. We prototyped it and we actually felt it, but the closer we got to launch, the more resources we needed to finish up the game. It was more about having every available person on the team to make sure the core game is great for launch. Then, post-launch, for the first couple of months, ‘Let’s make sure the game is stable, let’s make sure the systems are working well, and let’s plug any holes we see in terms of fun, new features.’ It was more a matter of focus right around a launch, then we turned our attention in a big way towards this. Now, for the past several months, a huge number of people on the team have been working on this feature, and it’s been the focus. The reason it’s taken so long – distractions aside – is this really is a game within a game. The complexity here is enormous. The amount of agency that players have compared to other systems in these types of games is enormous. There are so many edge cases and so many ways to play this mode, it takes an incredibly long time not just to build, but then playtest. You’ve got to live with the mode. We need to play it as much as we can to get a sense of what’s working and what’s not working an iterate on that. With the game doing well and being healthy, and our fans sticking around and supporting us, we felt less pressure to just rush something out there. We wanted to make sure it was great. So we took a couple of months and we invited some of the Alliances in the game to come try it out and got their feedback. You say you had this massive mode concepted before Marvel Strike Force was even close to launch. Does that mean you have the next big Alliance War-size mode thought up already? We do, but it’s a little too early to talk about it because it might change. We also have just a ton of systems that we really, really like and are trying to prioritize at the moment. There are so many different ways we can extend this game that it’s almost an embarrassment of riches because there are so many things that we want to do, and only a limited number of people to do them. What we try to do is balance giant systems like [Alliance War] with smaller systems players will appreciate. Another trap that teams that run live games like this one fall into is that it’s really easy to always do small systems that clutter up your pipe and your roadmap, so sometimes it’s hard to dedicate the time and resources to do big things. We have a commitment to prioritize big systems, which the downside of that is you slow down your general cadence. It’s a really tricky balance. With so much new emphasis being put on Alliances with this mode, are there any plans to improve the invite system? Finding new members or even inviting specific players to your Alliance can be a nightmare. What you’re talking about is one of the most underdeveloped parts of the game, and we’re acutely aware of that and we’re working on better tools for exactly that. 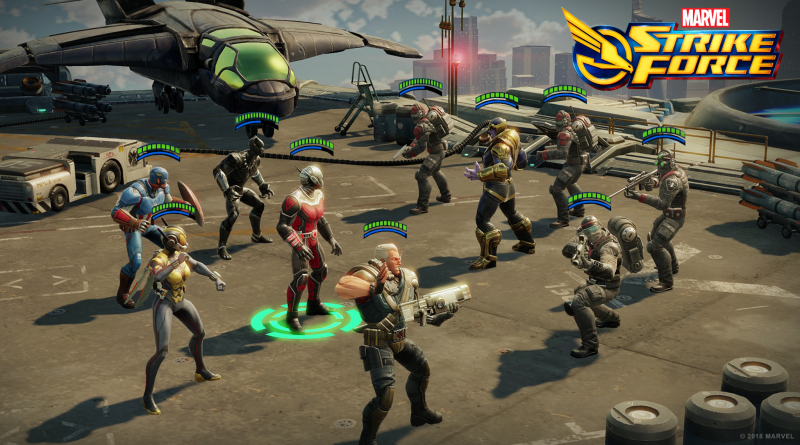 What has the team learned from the first year of Marvel Strike Force? We’ve run live games before, but the running of a live game constantly evolves, and the touchpoint with players generally increases, as does the level of sophistication of our player base. When we launched Marvel Strike Force, our cadence of communication with our player base was poor; we weren’t doing a great job of communicating enough, and we heard that feedback and we responded. I think we’ve become better at that. That’s an area we want to continue to improve on. More and more, we realized we’re all sort of in this together. We love having a good relationship with our player base. We love the feedback. We want the feedback. We want to build games in concert and hand in hand with our players. I think it’s a really difficult thing to do, because with a player base as big as the one in Strike Force, you have a lot of different opinions, and pretty extreme different ones. We’ve learned a lot about figuring out the true signal from our player base versus a lot of the noise that we hear. That’s an area we want to get better at. With so much noise and yelling online, how do you take the feedback that you find online and turn it into something constructive and actionable? We have a lot of very passionate employees in the company that are really listening. We have dedicated community managers and customer service who’s job 100 percent is to read all these things and filter out what we consider to be noise. It’s clear, right? You go on some of these channels and you see people ranting and raving, a lot of times it’s hard to take something meaningful away when there’s so much passion there. With every game and every service, you have a lot of haters who just want to come and make snarky comments. We try to pay less attention to those people, but there are a lot of people on these channels who are just enormous fans of our game and deeply passionate about it. And very articulate! They give us incredible feedback! When people say something that rings true, even if it’s not something we want to hear, it’s great because it’s a new perspective that we take very seriously. It’s not just the customer service people and it’s not just the community managers; we have people on our dev team – really talented people who are actually building things – on these channels all the time, reading and listening. Give me an overall assessment of Year One of Marvel Strike Force. This team and studio has been together since 2002. In many ways, this is the most successful game we’ve ever launched. I think the assessment is that the game is doing incredibly well. We announced that the game has done about $150 million in its first year, but what’s more impressive than that is the retention numbers. We’re seeing players who installed the game the day that it came… we’re seeing the size of that cohort actually increasing in the past few months, which means people installed it the day the game came out, played it a bunch, and now a lot of the ones who stopped playing it are now coming back to the game. It’s a lot stickier than I anticipated it to be, and we thought it would be a very sticky game. We’re seeing engagement increase, and we’re seeing a game that has the potential to be around for a decade. And that’s, far more than the revenue numbers, the thing that makes us the most proud about what we built. That’s ultimately what we’re in it for: to keep a really great community of players happy and entertained for a very, very long time. I think the indications that we’re seeing is that Strike Force is one of those games that is going to last hopefully forever. One of the biggest deterrents for a lot of people with free-to-play games is that they often either feel exploitative or unfairly tilted toward premium players or designed to push players into spending money. Obviously, there are systems in Marvel Strike Force meant to encourage players to spend money, but how do you balance microtransactions so that a free-to-play player doesn’t feel cheated when compared to premium players? That’s a really difficult thing to do. The way that we look at it is we 100 percent, genuinely want to allow players to play this game for free forever and have a really great time. It’s not our mission to make every single player in the game spend money. We look at our Arenas, and there are a lot of players in the top 50, top 20, even the top 10, who have not spent any money at all. That’s something we’re incredibly proud of. Like any hobby, if a player wants to spend money in our game, we obviously want to empower that and have that be an incredible experience as well. 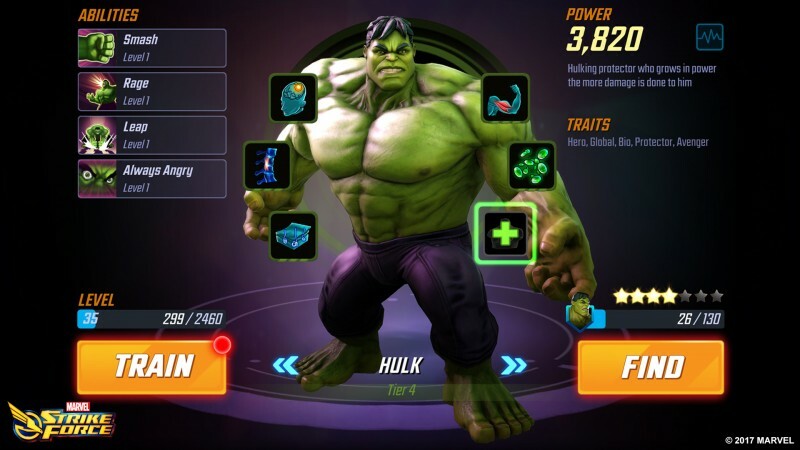 Last year, shortly after Marvel Strike Force launched, I wrote a piece calling the game “one of the most addictive game I’ve played all year.” However, one of my sole criticisms in that piece is that the game had some of the least appetizing microtransactions I’ve ever seen. How has the team tweaked those to make them more enticing for players? What we try to optimize for is to not gouge players for as much money as possible. We’ve learned that, in a lot of cases, that’s a very negative thing. A lot of times if someone spends too much money up front, there’s things like buyer’s remorse, or the equivalent of eating too much or having too much candy at once and feeling sick. We don’t try to create systems that encourage that. We want players to play for a very, very long time. Obviously we want them to spend money – we’re a business and we need to make money – but we want that to be a very measured spend. If you think about it, say Starbucks; a lot of people spend $15 or $20 a week on Starbucks on coffee and snacks and stuff and that’s a great value for them and they’ll do that forever. What I try to do is build a games business like that, where you can play it for free and you don’t have to spend any money, but if you do and decide to spend $15 or $20 a week or so, you’ll have a really satisfying experience with that spend. One way you’ve made players feel good about playing Marvel Strike Force is by compensating them for mistakes or outages. We don’t often see that with other mobile games. What is the line of thinking in being so generous with these make-goods? One of our core tenants is we do things that players thank us for. We want to provide the best possible experience, so if we mess up, we want to make good on that mess up. If you couldn’t get into a mode for a certain number of days, you just lost out on a certain amount of progress, and we take that very seriously. We take it on our shoulders for the players who experienced those, and for everyone else in the game, to benefit from that builds a lot more goodwill than the cost of what we’re giving out. We’re not trying to hide the fact that we mess up. We make mistakes all the time. We launch bugs and we make bad decisions on our live operations sometimes. We want our players to know that we’re figuring this out as well, and we’re trying our best and we’re trying to provide the best experience possible. We’re going to mess up sometimes and hopefully we’re going to learn from it and get better. An example of listening to players and fixing mistakes seems to be with the Dark Dimension tweaks you’ve announced. Can you talk about that a little? We wanted that mode to be incredibly difficult. We like having big challenges that are sort of aspirations for players to overcome one day, like a long-term goal to have. What we found was players feel like the entry to that mode is beyond challenging. The first few missions are so incredibly difficult that the mode turns players off. We’re either adding missions or tweaking the existing missions, but we’re going to create a more gentle ramp into the experience, so you can get in and immediately make some progress and feel good about the mode. With such a challenging mode giving players a hard time, do you know when the level-cap increase might come to give characters a small boost? Soon! I don’t know exactly when, but it’s something that we’ve already been working on and we’re queuing it up to go out very soon. I know if we do it too quickly, players get upset, but if we take too long, players get upset. It’s hard to know what the sweet spot is. We got a lot of feedback that we went a little too fast up to 70, so we want to be respectful of the player base. Like I said before, you have so many varying opinions, so sometimes it’s hard to know what the right call is. But I do think there are a lot of players who have been at 70 for a while now who are probably looking forward to that cap increase. Despite Dark Dimension being incredibly hard, some players have already beaten the hardest “Fear the Darkness” mode, which FoxNext set as a challenge to the community. What was your reaction when Widowmaker seemed to breeze right through that mode? That surprised the hell out of us! We did not expect someone to get through it that quickly! We expected it to be at least a year, but we thought what he did was super cool and super classy. When he beat it, he had his entire roster at seven stars except for The Hulk, so we were sure that’s the character he was going to pick as the character we gave out 100 free shards for, but for him to do what he did and hook up the entire player base [with Captain Marvel] was really, really cool. Was there any part of you that was disappointed he chose to give everyone Captain Marvel for free when you had just implemented all those milestones to unlock her? We knew that players would still want to power her up, and stories like this one with Widowmaker do so much good for the community. Giving that many free shards of [Captain Marvel] to everyone. And we have so many characters in the game; we have a packed roadmap. We love doing things like this that just make players happy and do things that players will thank us for. Also, with this login calendar that’s going on now with those milestones to power her up, we’re seeing some of the best engagement in the game that we’ve ever seen. We just look at it as an opportunity to do things that players will thank us for. We know we’ve done things that weren’t great for the community in the past, and we’re learning from those things, but the intent is to create the most entertaining game possible. Speaking of Captain Marvel, she was an obvious choice to add to the roster of collectable heroes since her movie just came out. Some choices are obvious, like when Venom came out and he was added or Infinity War brought Thanos to the game, but what is the overall process for determining which characters are added? It’s largely driven by what you just said. We know that when Captain Marvel comes out, players are going to be so excited for that character that they’ll want to pull up the game and interact with that character; that’s the primary driver. I would say that the secondary driver is our design team taking a step back and thinking about what the game and what the meta needs. For example, when we were designing Nick Fury, we knew he was going to be one of the most powerful [characters] in the game. We want the game to always be balanced, so when he comes out and he’s as dominant as he is, we start thinking about, “What’s a team that can challenge that SHIELD team, but not in a way that obsoletes them, but in a way that creates some fun and healthy competition within the player base?” When we approach it from that way, plus doing right by the Marvel Universe, it puts the right types of constraints on us to figure out which characters to focus on. How many new characters will we see in 2019? I think the cadence at which we’ve been going is something we’ll probably continue. I don’t think we’ll dramatically increase or decrease our cadence of new heroes. We’ve seen Doctor Doom appear as a non-playable character for special event raids. Are the Fantastic Four on the horizon? You told me last year that while you could get the X-Men, Marvel wasn’t giving the Fantastic Four to anyone. That has changed. We managed to secure the Fantastic Four. We’re incredibly excited about that, so expect some really cool stuff to come out. Did that have to do with the recent Disney acquisition of Fox? Not at all, actually. It was completely separate from that. 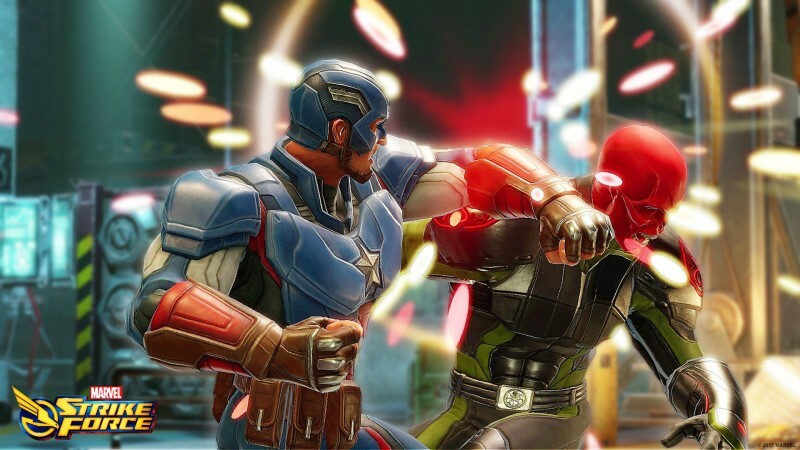 How does the acquisition affect Marvel Strike Force and FoxNext? It’s 100-percent business as usual. We just became a part of Disney, so before the deal is closed, there are some very strict legal reasons why the buyer can’t really interact much with the company they’re buying, so it’s been 100-percent business as usual since. Now that we’re a part of Disney, we’ve been assured that nothing is going to change with the way that we develop and operate Marvel Strike Force. Marvel Strike Force is incredibly important to Disney and it’s a very successful game. We don’t expect to change at all now that we’re a part of Disney. I know it’s very recent, but has anyone at Disney assured you that things will continue as they’ve been to this point or indicated that they’re happy with the game’s performance? Oh they totally have. We’ve talked to them and they’re very, very pleased with how it’s going. They’ve already assured us that there’s no plans to mess with a machine that is doing really well, and a game that is healthy and entertaining millions of people. They have no intentions in messing with that at all. Can you give any teases for the roadmap ahead? We love the Alliance War feature and we’re really excited about it. What I will tease and hint is that it in a way sort of scratches the surface with that feature, with how you can interact with the helicarrier, with how you can use that helicarrier to interact with other Alliances, how you can collaborate in building up a helicarrier. We’re just getting started with this release and I think you’ll see some really great improvements and even big, giant, new systems that will take Alliance War to another level. Do you have any plans for an event celebrating Avengers: Endgame? We try to do as many cool events related to what’s going on in the MCU as possible, so I would not be surprised if we did. Has the team explored bringing Marvel Strike Force to other platforms like consoles or PC? We haven’t because we’ve been so focused on creating the best possible experience on mobile. That said, I don’t see why it wouldn’t work really well on other platforms. It’s not really something we’ve contemplated, but now that you mention it, I could see it working on PC and console. What I will say is that if you think about the future of the industry, I think lines between PC, console, and mobile are just going to continue to get blurrier and blurrier and the screen that you play on is not really going to matter. You’re just going to be bringing your experience across every single different type of screen. I don’t know if we’ll ever get there for Strike Force, but I do know that’s where the industry is all headed. For more on Marvel Strike Force, check out our in-depth preview of the upcoming new mode, Alliance War.